Gentry Manor has been providing a unique shopping destination for over 20 years and features a progressive hair salon, full service spa, women’s fashion boutique, a wide selection of gift-ware, home décor & more. 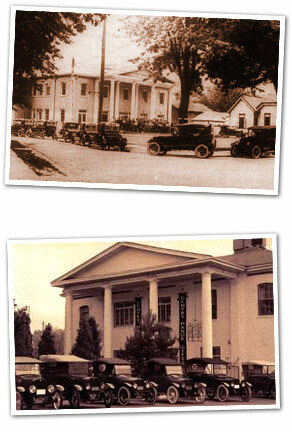 Gentry Manor has a long and diverse history, and has been a cornerstone of Park Street for over 130 years. The building began as the Chrysler Ward School and was built in 1876. The modest 6 room school was soon overpopulated and additions were added to become the Queen Street School. Around the turn of the century when the school was obsolete, William Gray purchased the property and it become known as Gray & Sons repair. It was then used as a repair shop for the Gray buggies that were manufactured in Chatham. William Gray soon began manufacturing the Gray-Dort auto-mobiles and buggy production slowed. At this time the repair shop became the Gray-Dort Social Club, a place where employees enjoyed billiards and silent movies – one of the first in North America. Soon after the Gray-Dort auto-mobile had stopped production, the building was inhabited by the Y.M.C.A. It hosted basketball games as well as many dances. The next incarnation of the building, and the longest so far, was the course of the Masonic Temple. The Masons sold the building in 1995 to Thomas Smith who resurrected it’s former grandeur and it became Gentry Manor.